When researching air conditioner replacement cost, its important to understand the process and vocabulary associated with air conditioner replacements. Use our air conditioner installation guide to help you understand what you need to consider when choosing a new central air conditioner system, including tax credits, financing, and the vocabulary required. Arguably the most important decision you will make is how efficient your air conditioning unit will need to be. A/C Energy efficiency is measured by its SEER rating, or Seasonal Energy Efficiency ratio. SEER Ratings currently run from a not-very-efficient rating of 13 SEERs to an extraordinarily-efficient 21 SEERs. 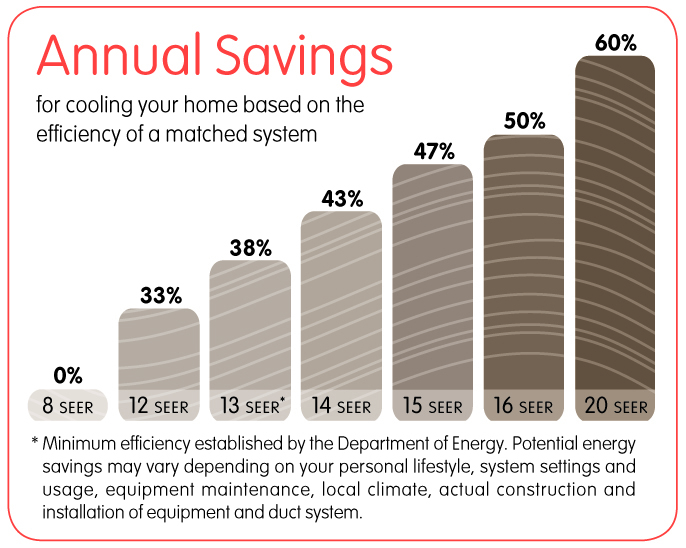 SEERs refers to the amount of electricity it requires to cool your home. Refrigerant is the gas that runs through your A/C system and allows it to cool the home. It does this by absorbing the heat in your house and transfers it to the exterior of your home. Refrigerant is also known as Freon. R-22 Refrigerant has been heavily utilized in older, less efficient models for many years. After several studies, it has been deemed as too harmful for the ozone and no manufacturer has been permitted to manufacture air conditioners that use this Freon type. This policy was instituted in 2010. R-410 A Refrigerant is the new freon type that has taken the place of R-22, which is safer for the environment. Because air conditioning manufacturers can no longer use the R-22 Freon types, almost all new units have parts that are specialized for R-410A use. We strongly recommend that when replacing your A/C system, you consider an R-410A model. The cost may be slightly higher than an R-22 model, but it guarantees (A)good stewardship of the environment and (B) there will be parts available for the unit should it need repair in the future. Single Stage air conditioner units cool the home at a set electrical power, even if the home requires less cooling than usual. This can result in wasted electricity and increased cooling bills. Two-Stage air conditioner units offer two different cooling outputs, Half-Power and Full-Power. Depending on the thermostat settings, your Two-Stage air conditioner will choose to run at whatever stage is the most appropriate and energy efficient for the time. The Two-Stage air conditioner will run at half-power until it is unable to maintain the thermostat's set temperature, in which case the full-power mode will kick on to accommodate. When it's running in first stage, it's using about half the electricity, but only putting out about half the cooling. For a very large portion of the year, a Two-Stage air conditioner will cool your home without accessing the Full-Power option. When it's running in first stage, it's using about half the electricity, but only putting out about half the cooling. It is important to note that while a Two-Stage air conditioner unit will run for a longer period of time than the Single Stage air conditioner, it will distribute the air in the home more evenly, which also removes more humidity from the air. If you experience higher humidity levels than normal during the cooling season, the Two Stage air conditioner can alleviate this problem. Desired Sound Output Level - If you cannot stand loud air conditioning units, higher SEER rated and Two-Stage central air conditioner units are the way to go. The first step our installation team takes is to introduce themselves politely to those in the home. They will also ask for your preference between booties and shoe removal when working within your home. Once the introductions are complete, they will review the quotation and the installation process with you, addressing any final concerns or questions before the work is started. This is done to ensure that everyone is on the same page and that you are 100% aware of the expert service you are receiving. When the installation is complete, they will review a checklist to make sure everything is complete and fine tuned to manufacturers specifications. Finally, they will run your system for the first time, walking you through the specifics of your system to help you achieve maximum comfort & efficiency! As a Trane® dealer, we offer top-of-the-line central air conditioner units, as well as heat pump condenser units. The key difference between these two types of cooling units is that central air conditioner produces only cool air, while a heat pump unit can produce both heated & cooled air. Because heat pumps are relied upon for all heating & cooling, they often require more maintenance than central air conditioner units. Free On-Site Consultation - Our expert HVAC technician will examine your central air system carefully, first determining if you are really in need of a new air conditioner installation or only an AC repair call. If it appears you are just in need of an informed repair, the technician on-site can usually take care of it that same day. Knowledgeable Recommendations - If the technician feels it is in the best interest of the family to replace the air conditioner, he will correctly rate the needs of your home. This step is critical to improving efficiency, overall home comfort, and the life of the new system once installed. In fact, depending on the age and condition of your old cooling system, the installation of a new system can save you hundreds of dollars a year on your energy bill! A comfort consultant will ask you a few questions about your current system, which will help us figure out what systems to recommend to you and what changes the system will need to undergo to address existing issues. After a thorough evaluation, our knowledgeable air conditioner installation technicians will sit down with you and explain our findings, make logical recommendations, and leave you with a few options and exact pricing on central air conditioning system that will fit your needs. Regular Coupon Specials & Set Quotations - We understand that cost is a consideration when replacing your heating and cooling systems, so we regularly offer specials on HVAC replacement and installations. Additionally, when we give you a bid for a new system, Mr. Duct Heating & Air Conditioning guarantees that we have quoted for all materials needed for the job. You will be provided with an official proposal clearly noting what equipment is needed for your research. We guarantee that there are NO hidden charges or fees, and taxes are already included in the price. We Service All Makes & Models - Though we are a Trane® Dealer, Mr. Duct's HVAC technicians are highly experienced with all air conditoner makes and models. You will never have to worry about an inexperienced technician coming out to your home. Always Know the Status of Your Appointment Time - With a state-of-the-art fleet management system, you will never have to worry about when (and if) your HVAC replacement technician is coming! Our emergency dispatcher will happily keep you updated on the technician's location, estimated time of arrival, and more. Know the Cost of Your Service Before We Start - As we've stated throughout the years, our technicians are there to work, never to sell. After providing his diagnostic, our technician will provide thorough and up-front pricing for your air conditioner repair service, before any work is completed. This means no hidden fees and no extra charges.